I am a rehab professional based in Perthshire and online nutrition/health advisor helping people throughout the UK and Ireland. Having previously been a professional sportsman, I have spent the last 15 years working in rehab and the last 10 years beginning a lifetime of learning in the world of nutrition. 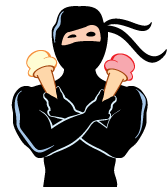 I could not recommend the Ice Cream Ninja more highly, in my first month I lost a stone in weight and several inches from all areas of my body. What's more impressive is that I did not really change my lifestyle to achieve these goals.